Occasionally a video game will come along that does something entirely unique and different. Sometimes these are art games and other times they bring fresh new mechanics. iOS is a great place for these as it has a low barrier of entry, typified in games like Year Walk ($3.99), Sword and Sworcery ($3.99), and others. Empire ($2.99) is one of those games. It is pushing boundaries by combining two different genres: 4X (think Civilazation) and rogue-likes. What emerges is an experience entirely its own. So far Empire seems hurt by some very bad marketing. It is a called a 4X, deck building game, and while those are mechanics used in the game, it is truly a finite survival game (rogue-like) . Each play-through you will try to hold out as long as possible but ultimately you will fail. In the quick tutorial you learn that you are part of struggling empire. Only a few cities remain and they are one by one being swallowed up by something corrupting the land called the desolation. Represented by purple squiggly weeds on the game map, it is constantly growing. If it grows to much it will become a monster nest which can either be attacked or will occasionally launch attacks on your cities. Like the classic Civilazation you will found new cities, harvest resources from the land, and use those resources to raise armies to defend yourself and stage offensives. Within each city you can add up to three upgrades. The 4X-ness then shifts. You can only have three cities and they slowly deplete the resources around them so you will have to abandon one city and find another. It is a cool mechanic but may be annoying if you were planning on really founding an empire. 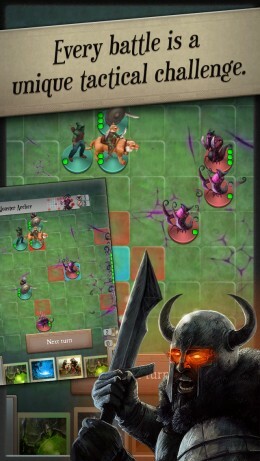 Combat in the game is a mix of deck building and lane positioning. Your forces start on the board in random positions and each turn will move one step closer to the enemy. Using the cards in your deck you can move your forces to new locations or slow the enemy. The cards you put in your deck will determine your options allowing you get avoid enemy archers or get the first swing on the enemy. While it is stressful and sometimes random, I really enjoyed the combat. The deck building choices you make will determine your typical strategy. My favorite I call “ The Enemy’s Gate is Down” (to borrow from Ender’s Game) where I push all my units to one side and then try to dodge all enemies and just head for their side of the board where I can damage their camp and win. It is hard work, but you these earned strategies are rewarding. On top of these new mechanics is an interesting art style, positioning itself as a fantasy universe you can’t quite pinpoint. The effect of seeing the board slowly consumed by desolation, as things get more and more dire, is very powerful. It maybe a generic style is some senses but I think it changes enough to feel different. If you are expecting a streamlined version of Civilization, this is not it. Empire is a rogue-like that uses the 4X genre as its base. I enjoy it for what it is, an experience that is both singular and innovative. Seriously, if you like strategy games, this is not one to be missed.